Cassotto accordions are renowned for their beautiful mellow tone but many accordionists have only a hazy idea of how this result is achieved. This article explains the ‘how’ and ‘why’ of cassotto using the Beltuna range of instruments as examples. 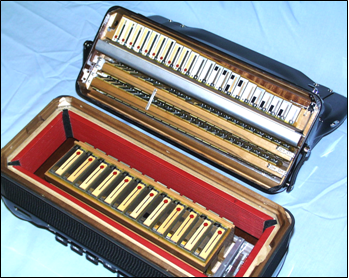 Cassotto accordions have one or more of the treble reed sets (or ‘voices’) partially enclosed in a special tone chamber to make the sound mellower and less ‘reedy’. In a ‘single cassotto’ instrument it is usually the bassoon reeds which get the special treatment. In a ‘double cassotto’ instrument it is the bassoon reeds and the clarinet reeds. You can experiment with the effect of a tone chamber by cupping the hands around a harmonica in various ways while sounding a note on it. The vibrating reed alone sounds rather bright and piercing. Partially enclosing it takes away some of this brightness. Technically, the sound from the vibrating reed is rich in harmonic frequencies (multiples of the fundamental frequency). The chamber reduces the intensity of the higher pitched harmonics compared to that of the fundamental note. Harmonics are important in music and make the basic sounds more interesting. Totally harmonic-free notes are easy to produce electronically, but they are so pure as to be boring. The most harmonic-free sounds in normal music probably come from organ pipes. It is the differences in harmonic structure that give different instruments their distinctive personalities and make the same notes sound different when played on different instruments. In the accordion the mellower ‘cassotto sound’ makes the instrument sound less ‘folky’ and more ‘orchestral’. Classical styles of music benefit from this, but folk musicians usually prefer the brighter sound that you get without a tone chamber. This explains why the normal arrangement is to put the clarinet reeds in the tone chamber and leave the other tremolo reeds outside the chamber. The clarinet reeds then sound nicely mellow when used alone, but when tremolo is selected (violin or musette couplers) the composite sound recovers the characteristic ‘bite’ of the traditional accordion. 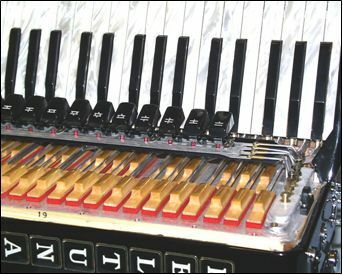 When you look under the cover of an accordion without cassotto you see a row of valve pads rigidly connected to the keys (upper picture). Each of the felt pads controls the airflow through four holes, one for each of the voices. In this example, which is a Beltuna Euro IV, there are four voices: piccolo, clarinet, bassoon and violin. Beneath the holes, which are covered by the pads in the photograph, sliding masking plates controlled by the couplers block or unblock the holes for the respective reed sets. Thus only the selected combination of voices is heard when a valve pad uncovers a hole. Cassotto models retain a similar set of valves but now they control only the musette and piccolo reeds. A second set of valve pads located inside the tone chamber is used to control the air-paths for the bassoon and clarinet reeds. The lower picture shows a Beltuna Leader V double-cassotto instrument and you can see, beneath the row of couplers, a long rectangular hole about 3cms wide that runs the full length of the instrument. This is the open mouth of the sound chamber and the sound from the bassoon and clarinet reeds emerges here. The valve pads are on the inner wall of the sound chamber and can just be seen running vertically in the photograph. Notice that each of the stiff metal actuating bars that join the keys to the horizontal valve pads now has a downward extension leading to the vertical pads, so that both valves in a pair operate simultaneously. The slot is actually the open end of a long U-shaped cavity made of aluminium. 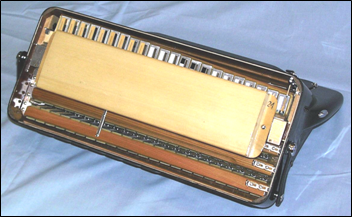 The closed end of the U-shape is inside the accordion and is clearly visible in the picture below. The bassoon and clarinet reed blocks are mounted on the outside of the tone chamber, on the face nearest to the user’s body, and perpendicular to the other sets of reeds. 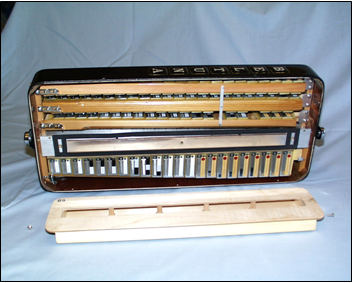 Cassotto accordions tend to cost more than non-cassotto and the photographs illustrate the extra mechanical complexity that accounts for this. For example, since each key operates two valve pads, precise manufacture and careful adjustment are vital. Otherwise, if one pad were to seat slightly before the other, the second one would never shut properly and air would leak. 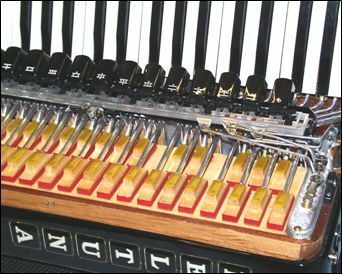 Notice also that the two reed blocks mounted on the tone chamber are not so accessible as the others are and this complicates assembly and tuning. A further refinement of the normal tone chamber is a tone chamber that can vary in size. This is what Beltuna’s patented Amplisound technique provides in their top-of-the-range Leader models. With this the musician is able to select between two degrees of cassotto effect. The fixed base plate seen in the photograph of the cassotto model is replaced by a flap that can be opened and closed using two extra ‘couplers’. A special hollow wooden sound box is then mounted on the other side of the flap as shown in the picture. With the flap closed, the effective tone chamber remains almost exactly the same as in the Prestige model because the extra box might as well not be there. However when the flap is open the two chambers become one large chamber with about double the volume. This gives an even more enhanced cassotto effect than with the original tone chamber alone. This is illustrated in the two lower pictures. 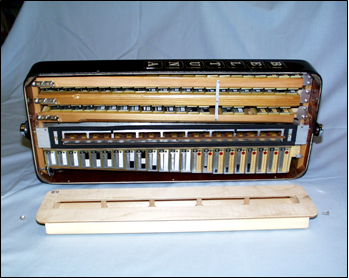 The sound box has been removed and the flap is shown closed (upper picture) and open (lower picture). Notice that in the lower picture the bassoon and clarinet valve pads can be seen inside the main cassotto cavity through the open flap.